Freedom of Religion or Belief (#FORB) has just launched the campaign “Believe it or not, it’s my right!” The effort aims at bringing together believers and non-believers to protect and defend every person’s right to freedom of religion or belief. They encourage everyone to take their logo, copied here, and carry it far and wide to overcome the hypocrisy and violence of religious bigots. This movement is endorsed and supported by members of STANDLeague.org, who have pushed it forward on numerous social media channels. This movement was made necessary because of surges in violence, oppression, harassment and indignity perpetrated by those driven to destroy or harm people who have religious convictions, or who hold none. As reported on the ADL.org website, anti-Semitism is a global phenomenon. Underscoring this, 70 percent of those with anti-Semitic views have never actually met a Jewish person. Growing persecution and violence leveled against members of the Coptic faith in Egypt have resulted in hundreds of Copts murdered between 2011 and 2017. A May 2018 Gallup poll found that the respect accorded Muslims in the West has fallen dramatically since 9/11. Specifically, 52 percent of Americans and 48 percent of Canadians said that the West does not respect Muslim societies. Smaller percentages of European survey respondents agreed. Further, 48 percent of American Muslims said they have experienced racial or religious discrimination. STANDLeague fully supports this movement. In 30 countries, the head of state for that nation must belong to a specified religious faith. Harassment of women on account of their religious clothing occurred in one-third of the world’s countries in 2012. Around the world, Christianity is the religion most discriminated against. Christians in 168 nations experience harassment. Muslims were found to be the second most discriminated against religious population between the years 2006 and 2010. Although Jews make up only 1 percent of the world population, they are the third most discriminated against religion. 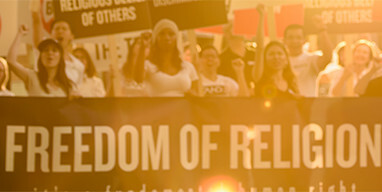 For these and many more reasons, Freedom of Religion or Belief launched its campaign. STANDLeague fully supports this movement. STAND considers that all religions and faiths must unite to overcome current trends of animosity and bigotry against religions.